The Sherwood Park Apartments are ideally suited to visitors who want the comfort of hotel or guesthouse accommodation, with the flexibility of partial or full self-catering accommodation. 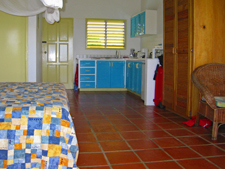 Our spacious holiday apartments are furnished to the highest standards, in attractive Caribbean style. Each apartment has either a double or two single beds, with high-quality box spring mattresses. An extra bed can be added, for a small additional charge. Most rooms have a dividing door to the adjacent apartment, making them ideal for families or groups. All apartments are fitted with ceiling fans and louvered French windows. The four ground floor apartments are air-conditioned. Sherwood Park is situated slightly uphill, so the six first floor apartments enjoy the cooling sea breezes that makes Tobago's tropical climate so very pleasant and which render air-conditioning unnecessary, even during the summer months. In addition to the eight standard apartments, we have two Suites on the upper floor. These are a little larger than the standard apartments. 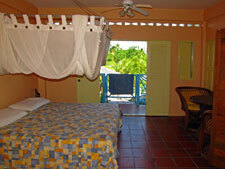 All rooms have wide French doors opening onto private balconies with table and chairs. The balconies provide wonderful panoramic views, illustrated above, over the lush tropical garden and swimming pool and through the surrounding hills to the Atlantic Ocean at Little Rockly Bay. Each apartment has a table and two chairs, ample cupboard space and a small safe. The bathroom has a shower with hot and cold water, a toilet and a washbasin. The kitchen has an electric hob, microwave oven, refrigerator, toaster and coffee maker, with an adequate supply of crockery/utensils. To maintain the highest of standards, every apartment is cleaned daily. All bed linen is changed regularly and towels, including larger "beach" towels, are available daily. 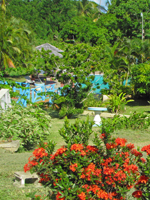 Our 45 x 20ft swimming pool is set in lush tropical gardens. Like the attractive garden terrace, the pool area is furnished with numerous parasols, chairs and sunbeds offering guests a variety of places to relax and enjoy our wonderful weather, either in the sun or in the shade. You will find no need to reserve your sunbed by putting a towel on it at 7am here! The garden terrace also has a barbeque unit for guest use. With no busy roads or other distractions within site or hearing, you will feel at one with nature in the grounds of Sherwood Park Apartments. It truly provides a holiday accommodation location to relax and recharge one's batteries; ideal for those looking for peace and tranquillity. Providing the very highest standards of personal, friendly service in a peaceful and tranquil location would be wasted if the fabric of the buildings and quality of furnishings was of lower standard. The management of Sherwood Park Apartments are very aware of this and so undertake a constant program of refurbishment and improvement. Our buildings receive constant and regular painting and maintenance to ensure that they compliment and enhance the natural beauty of the location. Most of our internal and external furniture was exchanged for high quality replacements, largely shipped from Europe, during a major refurbishment in 2002/2003. At that time, the four ground floor rooms were fitted with efficient, quiet, air-conditioning units. Sherwood Park Apartments - Spacious, Comfortable & Flexible!